We seemed to be busy most of the day but on reflection not much appears to have been achieved. It all started to go wrong after Jan finished the laundry. No sooner had the washing machine finished and we discovered there was no 240V. “Look for the simple thing first!” I checked the RCD and the MCB’s in the consumer unit and they were all OK. Working back from the consumer unit I discovered the 240V inverter supply was only delivering 60V. Something is obviously wrong with the inverter. It has defeated me for the moment! However the lack of 240V raised another problem. Youngest son needs his laptop to be regularly recharged as he works remotely via the internet. Consequentially attention switched from fault finding the inverter to seeking an alternative 240V source. We walked into Rugby and confirmed he could access mains power at the library. Then I had one of my brilliant ideas and suggested we buy a small 12V to 240V inverter from Maplin. The local store had a selection of different sizes which was fortunate because Daniel didn’t know the power consumption of his MacBook (yes..he is an Apple man…YUK). We don’t have that problem because I had made a 12V to 19.2V converter for the Asus laptop last year. After some research he selected a £29.99 150 Watt inverter which has proven to be a success. After this unforeseen distraction it was time to return to the planned tasks, the first of which was to continue with the cleaning and repainting of the engine compartment. A short trip to Homebase resulted in the purchase of a small rotary wire brush for the battery powered drill. Back at Waiouru and almost ready to enter the garden shed when I realised the drill battery was flat. I need to recharge it on the240V (There’s a hole in the bucket…). Plan B – polish the boat. Hang on… it’s a 240V polisher. Plan C – service the Kipor generator. Out comes the Kipor from storage and drain the old oil into a plastic container. The oil looks new! Probably not surprising given the limited number of hours the Kipor has run in the last 14 months. Still, you can’t judge the quality of oil by its appearance. On finding the new oil container it’s apparent there isn’t sufficient oil to complete the exchange. Off to Halfords for another container. Back at the boat and the Kipor has now been serviced. Time to stow it. But wait…. 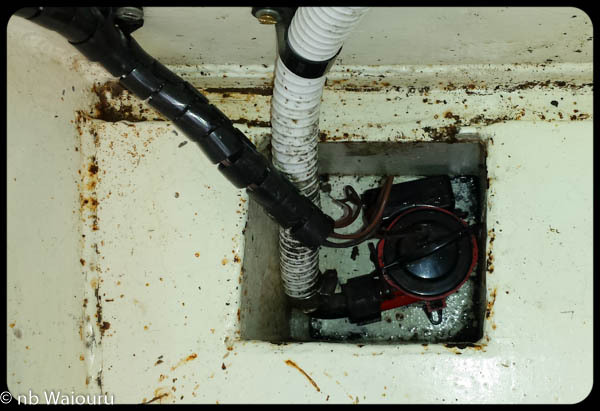 Before I return it to the locker it might be prudent to check the bow bilge pump is clean and working. Oh, the bilge pump doesn’t work. Photo of the cratch bilge after it had been cleaned of rubbish. The pump automatic float switch worked but not the manual over-ride. Some fault finding is required. 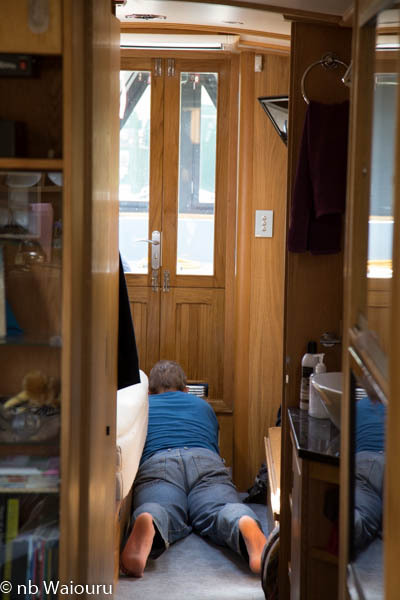 First task was to connect the laptop to the Empirbus system and monitor whether the bilge switch was working. The switch was working, so the next step is to check there is 12V at the node. OK… there is 12V at the node terminals. 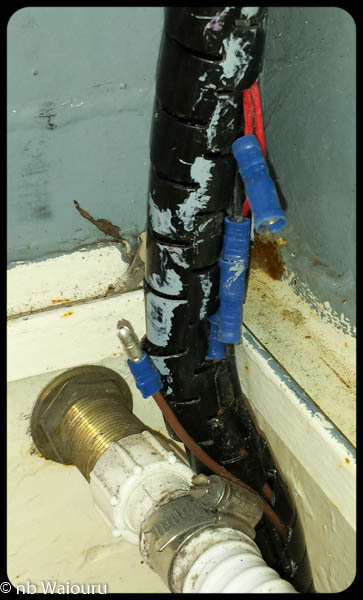 The problem must be in the wiring between the node and the bilge pump. And there is the problem. One terminal has parted. A simple task of servicing the generator has taken several hours. I’m getting tired! I tried to hide in the bedroom and have a nap (as we oldies do!). Jan told me the water pump was making an unusual intermittent noise. Just another piece of equipment to check! Actually the water pump is an essential piece of equipment and we don’t have a replacement. Consequentially another hour was spent on the internet searching for a backup pump (unsuccessfully)! The last task for the day was to wire in the power supply for the new wireless TV headphones. My hearing is shot and Jan doesn’t like the TV volume up high. The solution is for me to wear the headphones. 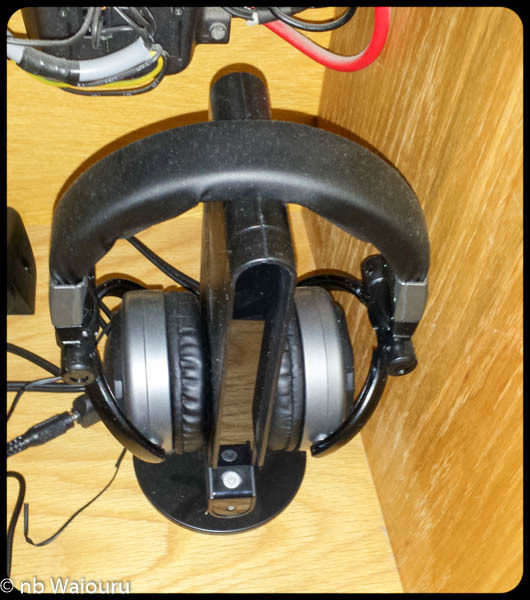 Despite appearances, I wasn’t silly and purchased headphones with a 240-12V power supply. 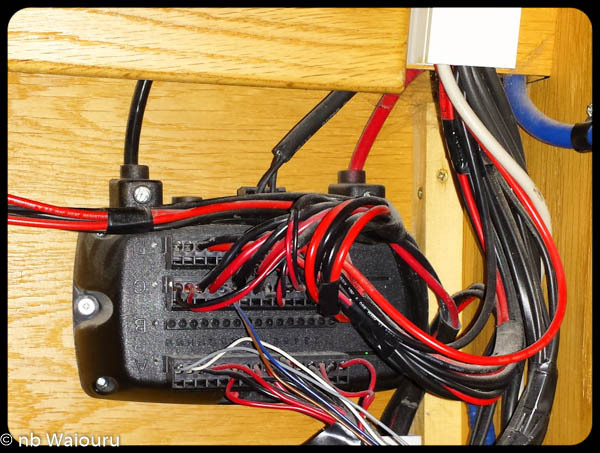 It was just a case of cutting the power pack off the power supply cable and wiring the system directly into the boat 12V system. 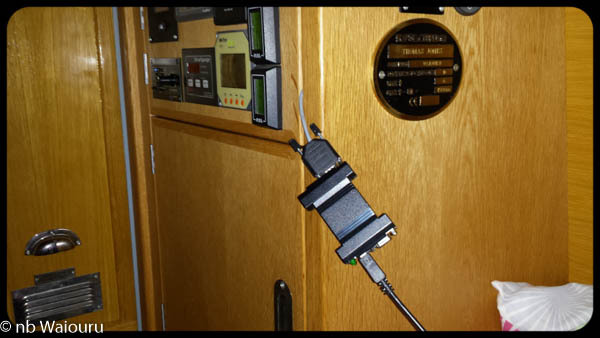 The Empirbus configuration file was then modified to ensure there is power to the headphones when the TV amplifier is turned on. Much easier to modify the system using the keyboard that physically alter the boat wiring. The transmitter sits behind the TV where it is out of sight. The “to do” list doesn’t seem to be getting any shorter! Yes David, the grand plan was to always have an alternative energy source. Battery charging can still be achieved using the engine. Dolt….. Look for the simple things first! We’re off…. But not that far!